Club Penguin Cheats by Mimo777 Club Penguin Cheats by Mimo777: Club Penguin Pin Cheat - FROG Pin! Here is how to find the new Club Penguin Frog cheat. Step 2. Now go to bottom by the water. Step 3. Now click on the FROG PIN! 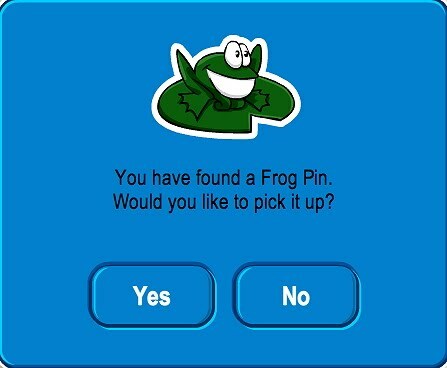 NOW YOU HAVE THE NEWEST CLUB PENGUIN PIN, THE FROG PIN! really like the new pin thx mimo! Mimo what is your favorite server on club penguin. Mimo why did you make the quality lower? BTW nice!! Umm... they never did. They only let you change the direction you were sitting in. "S" lets you sit. I love making the quality lower! i would still LUV to send pics to you so can anybody tell me how??? it never let u sit :[ i totally wish it did! u have 2 hit "s" to sit THEN you can use the arrow keys to change directions! Please don't use caps you're hurting our ears!!!! And maybe something is wrong with your keyboard because you can still sit by pressing the down arrow and changing the direction with all the keys. Hey Mimo do you remember when Hebert dropped the seed pouch in mission 10 well maybe he will interfere or be hiding there... btw my username on CP is Leno. lol. It is kind of funny. Ummm... Bobhead202? Yeah they do let you sit. I never use 's' to sit. I always use the keys. You are soooo shouting. Second of all, they still do, I just tried. Even if they don't, just use your S key and press it while moving around the mouse. It still works, maybe your keyboard is Glitched! I know, RIGHT?! I lovvvve frogs! maybe it is a sign that there will be frog clothing... ok not really. that would be cool though. dorry i havent been commenting much. i am busy checking the twenty various tootsville blogs and stuff. Chaos6267 out! The arrow of keyboard still let u sit down.. u press the down arrow and able to sit down..and can change other directions using other arrows too! Remember Dont put (cpg mod) unless your are modding! Sorry Bobhead but the arrows on the keyboard did make u sit down! I remember! Maybe they have something to do with Earth Day! I'll look for you on CP! The keys never let you! The frog is so cute!! It's my penguins birthday party tommorrow! It will be 2 years old! I will remind you all tommorrow! See you there! Hey mimo i dont now if you noticed but when you talk to sensei you see the white gem for card jitsu snow and if you click it he well show you the gem of card jitsu snow and water. Um yeah only the arrow keys work bobhead i always use them and s wont work.Oh and fredfan4ever please watch the caps your hurting my ears! (cpg mod) mario and also known as on cp mario85827. Hi! Please dont put "CPG MOD" after your name when you arent modding! Thanks! AWWWWW, I cant come. Soccer! And please dont put "CPG MOD" afer your name when you arent modding! Thanks! Sorry I just love doing that!!! It's sooooooo cool!!! Funny pin!!! For your information M@rio, I was not using Caps at all. Maybe I should be yelling at you for doing nothing. I did not yell. Jeez. I didn't do anything. Get the facts right. Yea, Its Funny and awesome! Yea, it sure is! its my fav so far. Its twenty-four more days 'till my penguin is a year old!I might have a party! Hnwjanuary11? Why arent u modding? I REALLY want u to see a few comments in the "Club Penguin MOVIE!?!?" post. Its awesome!!! U have to take a look! Thanks. I put a lot of effort into it and u will see what i mean once u see it. BTW fredfan4ever, so u really recegnized me from commenting on here when we met? Cool. I still dont knnow why everyone adds me and follows me around and shows the heart sign. its weird. OOH OOH! Pick me, pick me! I wrote a poem about the word, weird! Weird is a giant bug coming and and saying,"Hi,Bob!" randomly. One thing about weird is that it is usually phunnie! Green For Earth Day Isn't it Huh ??? it looks so cute!! rock on cp. Milk came out of my nose when i read ur poem on the word 'wierd'! Congrats on becoming a finalist for poem writing! I will come as i am in england! i will have to leave by 8 BST though... also, please dont put CPG mod after your name if your not modding. thanks! Im not sure where Hnwjanuary11 is. I haven't seen her on CP for a while. Uhhh sorry about that. Sometimes I just type so fast I put what I was doing earlier or something like that. I mean it is weird! Hey everyone! It is my party today! My penguin will be 2 years old! Check above this comment for the detailed comment! See you there! Thats nice! my penguin is already 2 years old! 874 days to be exact! Yup, that would be awesome! i wonder when will the new mission come out..
thx for the new pin mimo! Sweet! (WARNING:Epic cheesey frog face alert! );) ps.the earthday party is coming on the 22nd of april! Waddle on cpg. Hey guys. I was wondering if Club Penguin should have a Herbert, Rockie, Jet Pack Guy, Klutzy, G, and all the famous penguins pin! That would be awesome. P.S. How do I become a mod? To become a mod, you have to answer peoples questions,so you have to copy and paste the person ur gonna answer into the box, then reply to the answer, like what i am doing now.U then put ur name at the end and put(CPG MOD) next to it. For some reason when I go to the frog pin its asking me to buy undefined for undefined coins! just wanted to tell you, club penguin galaxy has an exclusive sneak peek from billybob yesterday. Zak is Back sorry to say but agents go find him! ___________________________________For your information i didnt know cuz i dont know you smart one.